Apologizing: I think it’s safe to say that we all agree it’s a good thing. We know we need to do it when we’re wrong – we value “saying sorry” as the “right” thing to do. Actually putting it into practice? That is a whole other story. Why is that? For starters, I think the main reason is that the majority of the time, we don’t want to admit to ourselves and/or the other person that we’re wrong. Our natural tendency is to want to “save face.” Admitting we’re wrong makes us vulnerable: We risk being rejected by others as “bad” if we allow others to see our errors for what they are. But have you ever had an experience where someone came to you and sincerely apologized? How did it make you feel? Chances are, it allowed you to soften toward them, and have empathy and compassion. Their admission of guilt and willingness to take responsibility, if done in humility, with genuine remorse, probably didn’t make you think less of them. In fact, it probably made you respect them more. 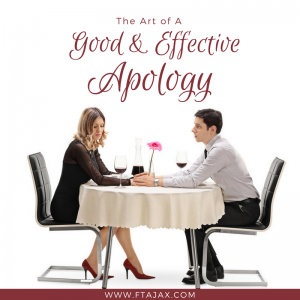 Another reason why apologizing can be so hard is because sometimes, the situation is messy. There’s a multi-layered, complicated conflict, where there isn’t one person who’s clearly “right,” and one who’s clearly “wrong.” This can make apologizing difficult because a) we aren’t certain about whether or not we should apologize, or what exactly to apologize for, and b) we are afraid that if we apologize for our part in the conflict, the other person will take it to mean that we’re letting them off the hook/that they don’t have any responsibility to take in the situation. When you’re not sure whether or not you’re at fault or what exactly you need to take responsibility for, I suggest finding a neutral third party to ask for feedback. Give them the facts without trying to “spin” the situation to paint yourself in a positive light. Try to be as honest, forthcoming and objective as possible. Then invite them to weigh in on what aspects of the situation are your responsibility to apologize for. And though it’s true that there is no guarantee the person we’re apologizing to will respond in kind, the fact is that your chances of getting a humble apology from someone are much greater when they feel safe with you. It’s much easier for them to let down their defenses and look at themselves honestly when you’ve shown willingness to do the same. Below are some tips for how to apologize well. Following these guidelines will help you as you work toward repairing a damaged relationship. 1) Stay away from defensive apologies– which actually aren’t apologies at all. -Following I’m sorry with the word “but” (or any synonyms such as “however.”) When we say “I’m sorry, BUT…” anything said after the word “but” pretty much completely negates the apology altogether. Even if you’re only 10% wrong, and the other person is 90%, own your 10% and apologize for that specific portion of the conflict. You may need to wait a bit to talk about your concerns about the other person’s behavior. I’m not suggesting you brush it under the rug; just don’t bring it up in the same sentence as your apology. -Sarcastic apologies such as “Well, I’m sorry you feel that way,” (which basically just blames the other person for their feelings or perceptions rather than taking responsibility for how you may have come across) or “I’m sorry you’re so oversensitive.” After all, sarcasm is the complete opposite of sincerity, and in order for any repair to happen in the relationship, apologies must be sincere. 2) Make sure your body language and tone of voice match the words you’re saying. Convey respect and humility by using a softer tone and maintaining a relaxed stance. (This does not mean you need to grovel in shame). You can apologize with humility and also maintain your dignity. Ask if there’s anything you can do to help make things right. If there’s something you’ve done in a relationship that seems irreparable – you’ve tried making it right with the other person, but the wounds are just too deep, or the conflict is too messy and complex to sort out on your own, know that we are here and more than happy to come alongside you and help you work through the problem together. Schedule an appointment – it could make all the difference in repairing and restoring your relationship, and also your sense of worth and dignity, if the mistakes you’ve made have got you weighed down with shame.